What’s in a Name? Well, apparently a lot if a single species of jellyfish can commonly be referred to as the Portuguese man-of-war (Physalia physalis). A Portuguese man-of-war’s sting is incredibly painful to man and can cause serious effects. Just the sound of it demands respect. This invertebrate, infamous for its extremely powerful and painful sting belongs to the Cnidaria phylum and is a member of the Hydrozoa class. Cnidaria includes jellyfish, hydras, jellyfishes, anemones, and corals. This ancient phylum, which is at least 500 million years old contains about 9,000 marine species and some of the most beautiful, interesting, and perhaps most dangerous (marine) invertebrates (Wallace and Taylor, 1997). Hydrozoans usually prefer shallow water where their colonies (associations of individuals that share food often and or divide up ecological roles) can contribute heavily to surface growth on submerged objects (Meglitsch and Schram, 1991). The Portuguese man-of-war is likely one of the most complex and specialized hydrozoans (Wallace and taylor, 1997). Portuguese man-of-wars are easily recognized by their nitrogen-filled, iridescent float. This structure may reach three to 12 inches in length and can extend as much as six inches above the water. Beneath the float is a colony of three types of polyps – dactylozooid, gonozoid, and gastrozooid. The functions of these polyps include detecting and capturing prey, feeding, and reproducing. The colony is so superbly integrated that they appear to be one individual. The tentacles hanging from the polyp colony are as long as 165 feet in length. Another distinctive feature of Portuguese man-of-wars, as well as all Cnidarians are stinging organelles called nematocysts. The neurotoxin secreted is about seventy-five percent as powerful as cobra venom. In the manof- war, it is found in the dactylozooids tentacles that paralyze prey such as crustaceans, small fish, algae and other members of the surface plankton. The gastrozooids then attach to the immobilized victim and digest it with enzymes that break down proteins, carbohydrates, and fats. This process is called phagocytosis. The blue bottle fish (Nomeus gronovii) has some immunity against the nematocysts and resides among the tentacles for shelter. The loggerhead turtle, (Caretta caretta) is an example of a predator to the Portuguese man-of war despite its presence of nematocysts (Dando and Burchett, 1996). It is no surprise that the Portuguese man-of-war is a widely distributed species in warm seas throughout the world, including the tropical and subtropical regions of the Pacific and Indian oceans, and the northern Atlantic Gulf Stream, although found in warm seas throughout the world. This may be attributed to the fact that man-ofwars reproduce sexually and asexually. Initially, man-of-wars reproduce sexually, where the sperm of one mature colonial hydroid fertilizes the egg of another to create a larva. This larva then reproduces itself via mitotic, asexual reproduction to yield genetically identical colonial offspring within and onto itself. Sexual reproduction results in genetic differentiation, and asexual reproduction allows for rapid growth. Combined, both processes lead to a rapid increase in species numbers that increase opportunistically in favorable conditions with suitable temperature, adequate food, and enough space to live. 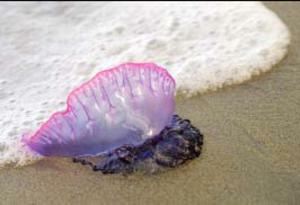 As previously mention a Portuguese man-of-war sting is incredibly painful to man and can cause serious effects. Fever, shock, and interference with heart and lung action are just three examples. When stung, carefully, pick or brush off any visible tentacles. It is best to use an object other than your hands such as a towel or fins. Rinse with fresh or salt water. DO NOT use vinegar. For severe pain, try applying heat or cold, whichever feels better to the victim.